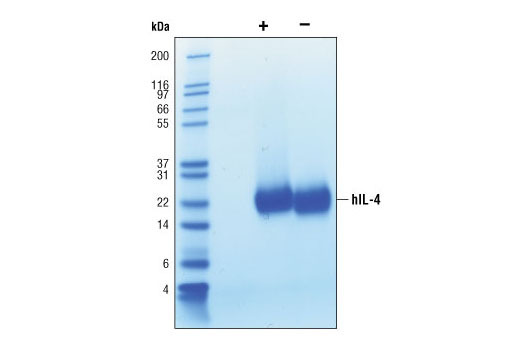 The purity of recombinant hIL-4 was determined by SDS-PAGE of 6 µg reduced (+) and non-reduced (-) recombinant hIL-4 and staining overnight with Coomassie Blue. The proliferation of TF-1 cells treated with increasing concentrations of hIL-4 was assessed. After 48 hour treatment with hIL-4, cells were incubated with a tetrazolium salt and the OD450 - OD650 was determined. 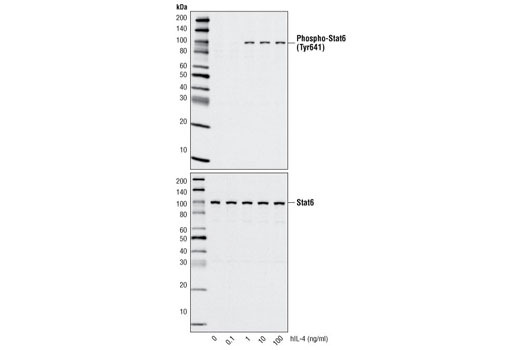 Western blot analysis of extracts from TF-1 cells, untreated or treated with hIL-4 for 20 minutes, using Phospho-Stat6 (Tyr641) (C11A12) Rabbit mAb Antibody #9364 (upper) and Stat6 Antibody #9362 (lower). Recombinant human IL-4 (hIL-4) His25-Ser153 (Accession #AF395008) was expressed in human 293 cells at Cell Signaling Technology. >98% as determined by SDS-PAGE of 6 μg reduced (+) and non-reduced (-) recombinant hIL-4. All lots are greater than 98% pure. Recombinant hIL-4 does not have a Met on the amino terminus and the nonglycosylated protein has a calculated MW of 14,963. DTT-reduced and non-reduced protein migrate as larger 20 kDa polypeptides due to glycosylation, with non-reduced having slightly greater mobility due to an intramolecular cystine. The expected amino-terminal HKCDI of recombinant hIL-4 was verified by amino acid sequencing. The bioactivity of recombinant hIL-4 was determined in a TF-1 cell proliferation assay. The ED50 of each lot is between 80-250 pg/ml. Less than 0.01 ng endotoxin/1 μg hIL-4. With carrier: Lyophilized from a 0.22 μm filtered solution of PBS, pH 7.2 containing 20 μg BSA per 1 μg hIL-4. Carrier free: Lyophilized from a 0.22 μm filtered solution of PBS, pH 7.2. IL-4 is produced by T cells, NK T cells, γδ cells, and mast cells (1). Target cells include B cells, T cells, and macrophages (1). IL-4 induces differentiation of naive T cells into the TH2 phenotype. IL-4 also promotes B cell proliferation, antibody isotype switching and expression of other TH2 cytokines including IL-5 and IL-9. 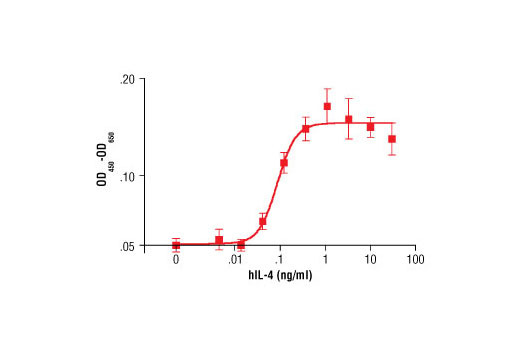 IL-4 induced TH2 polarization is important in developing humoral immunity against extracellular pathogens (1) and is involved in the development of allergy and asthma (2). IL-4 binds to two distinct receptors, the type I receptor and type II receptor. Type I receptor is a heterodimer consisting of IL-4Rα chain and the common gamma chain, γc (3,4). Type II receptor, which is shared with IL-13, is a heterodimer of IL-4Rα and IL-13Rα1. Signaling initiated via type I receptor results in the activation of Jak1/Stat6, Jak3 and the PI3K/Akt pathways (3). The type II receptor activates the Jak1/Stat6 and the Tyk2/Stat3 pathways (3). Corthay, A. (2006) Scand J Immunol 64, 93-6. Nakajima, H. and Takatsu, K. (2007) Int Arch Allergy Immunol 142, 265-73. Wills-Karp, M. and Finkelman, F.D. (2008) Sci Signal 1, pe55. Mueller, T.D. et al. (2002) Biochim Biophys Acta 1592, 237-50.